We’re sharing stenciled holiday cards today on Day 2 of our Blog Hop and Giveaway with our friends at Quietfire Design! There is more eye candy to enjoy from both design teams. Be inspired and read to the end of the post for an opportunity to win one of the giveaways! 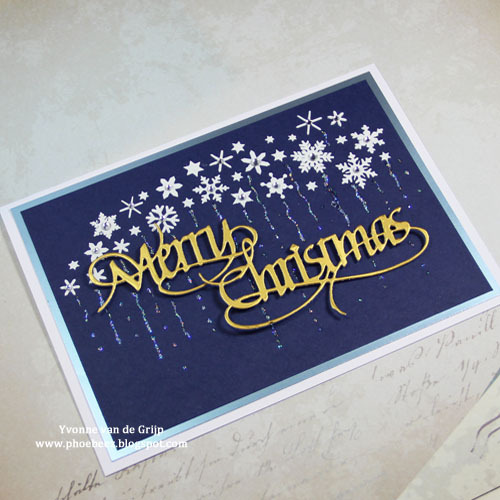 With a stenciled design, this card is all about simple layering with an emphasis on the Quietfire Design Merry Christmas 2 Metal Cutting Dies die cut and our 3D Foam Squares. With a white card base, I layered with ice blue and dark blue cardstock using the E-Z Runner® Permanent Strips Refillable Dispenser to adhere to the card base. Next, I created a starry background by using Quietfire Design’s Leaf and Snow Sprays Stencil with white texture paste. I love the contrast! Then affix the Quietfire Design Merry Christmas 2 die cut using 3D Foam Squares White Mix (smaller size). Note that I cut the 3D Foam Squares in half to fit the narrow lines of the die-cut. Finish the card using rhinestones and glitter glue. This gorgeous stamp design motivates me to get started on my Christmas Cards. I love the look of foil papers, especially when making an elegant looking card. Even though these gold papers are super slick and smooth, the Permanent Strips Refill in the E-Z Runner® Grand Refillable do the job with no problem. Once I stamped the beautiful Merry Christmas Flourished Tree – Set of 3 Stamps – Mounted onto the white paper, the permanent strips adhesive holds great to the foil paper. Then I used Crafty Foam Tape White under the gold paper to give lift and dimension to the card. The background of the card with the stars was created with the QuietFire Designs Butterflies and Stars Stencil. When using stencils I always use MyStik® Repositionable Dots to hold my stencil in place as I work. Once I have it in place, I used Distress inks to create the stars. When finished, just rub the Repositionable Dots away with your finger. They don’t leave residue or marks and hold the stencil perfectly while I work. You could also use the E-Z Runner Grand Repositionable Dots refill too! The sentiment that came in this beautiful script set was stamped on the inside of the card. 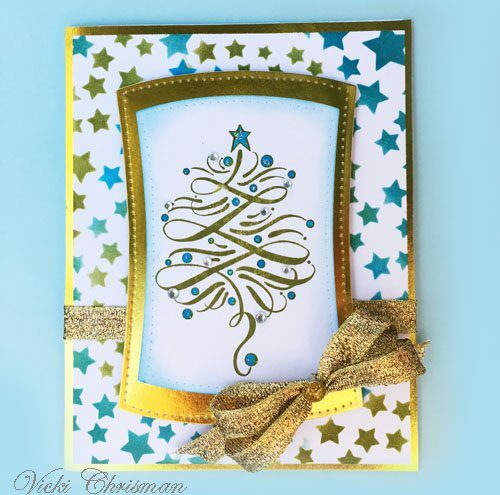 Dimensional Cards on Quietfire Design Blog Hop and Giveaway – Day 1! Quietfire Design Blog Hop and Giveaway – Day 2! 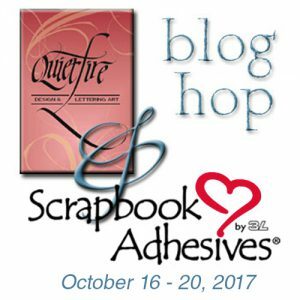 If you cannot see the comment section (at the bottom of this post), please click: Quietfire Design Blog Hop and Giveaway – Day 2 and scroll down to the bottom of the post. This entry was posted in 3D Foam Squares, Adhesives, Announcement, Cards, Crafts & Tutorials, Crafty Foam Tape, E-Z Runner® Dispensers, E-Z Runner® Grand, MyStik® Dispensers and tagged 3D Foam Squares Mix White, 3D Foam Squares Small White, Blog Hop, Card, Card Making, Christmas, Crafty Foam Tape White, E-Z Runner Grand Dispenser, E-Z Runner Grand Permanent Strips Refill, E-Z Runner Grand Repositionable Dots Refill, E-Z Runner Permanent Strips, E-Z Runner Permanent Strips Refillable, E-Z Runner Permanent Strips Refillable Value Pack, Holiday, MyStik Repositionable Dots, Quietfire Design, Stencil, Thin 3D Foam Squares White, Vicki Chrisman, Yvonne van de Grijp. Bookmark the permalink. 31 Responses to "Stenciled Holiday Cards on Quietfire Design Blog Hop and Giveaway – Day 2"
Wow – these cards are so elegant! I like making clean & simple theme cards such as one or two colors or not 3 D. And it’s fun to put a speck or two of glitter somewhere! Such gorgeous cards! Thank you for the inspiration! Love the drizzle from the snowflakes. The second card is so rich with the gold. I learned about texture paste from a friend at the expo. I like doing crafts that sparkle! More beautiful cards! 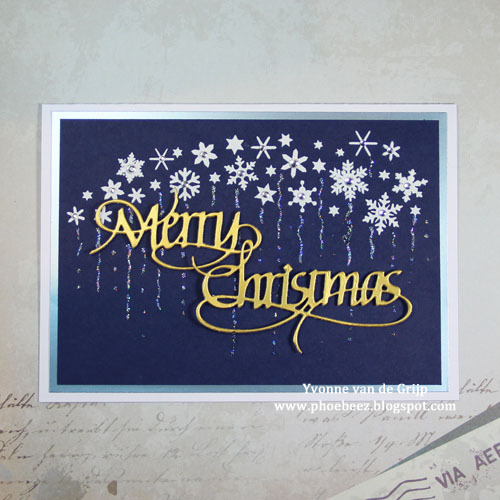 I love the ice blue cardstock and the snowflakes in the first card. Love these cards! I am a full on glitter, foil and jewels ???? on my cards! TFS! What beautiful cards! Thanks for the inspiration and for the opportunity to win! I love the “Merry Christmas” metal cut adhesives. I have a simple card making style. No Glitter or anything like that. The cards are so elegant! Lovely cards today! Enjoying the hop! My style is clean, with a little sparkle and heavy on the cuteness scale! Both cards are very pretty! I like the use of the foil papers. It really adds to that “holiday” feel. Awesome and elegant Xmas cards!!! Love the beautiful Christmas cards. The falling snow is so pretty. Lovely cards. I adore the beauty of snowflakes. Clean and classy. Beautiful Cards ladies!! I love glitter. Love the cards!!! 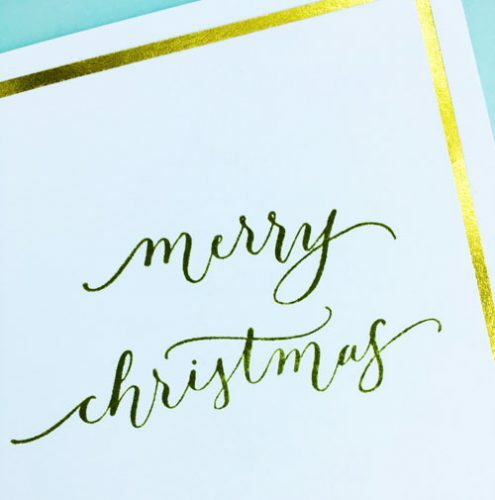 I do so love the cards – the metallic paper adds a pop to the cards and usually like the sentiments, but do not like the lower case merry Christmas which is a proper noun and is to be capitalized at all times. These Christmas spirit cards are so beautiful ! My card making style would be full on glitter! Really like the ‘trails” from the snowflakes on the first card – what a great idea!, and the detail on the inside of the second beautifully finishes the card.